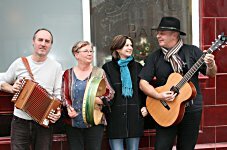 OBOSCA (Irish Gaelic: box) is a unique group of poets and musicians. The group provides solo readings and collaborations, as well as music and song with an Irish/folk flavour. They have performed together, singly and in pairs at many venues including The Troubadour, the Redroaster Café, Brighton, Havant and Salisbury Arts Centres, Gosport Discovery Centre and of course, The Florence. Obosca is available for small functions. E-mail: barneymacdonagh@mac.com or maggiesawkins@moose-mail.com.